Staff of our company perfectly understands all the importance and complexity of the accountant work and therefore approached to creation of an exchange with 1C systems extremely responsibly. From that, how quickly the accounts department will obtain sales data and receipts of money directly depends the vision of company by management. Correctness and relevance of such data are vital for the organization because calculation of salary and taxes are based on them as well as estimating of company’s profitability and forming plans for its development. At the same time, it would be inadmissible courage to interfere the work of accounts department directly. That’s why the “SuperOkna” program is ready according to the first requirement to prepare and transfer the necessary data to “1C”, but it is absolutely safe unlike some other decisions, and it can’t serve as the reason of any failure. Slightly concerning technical details we will tell that “Superokna” prepares the special report in a format of 1C systems and transfers it to processing of accounts department leaving for you the decision when, how and in what amount to accept the provided information. By the client’s request the minimum efforts will allow to create the automated channels of information transfer from “Superokon” to “1C”, excluding the need to prevent your accountants from working. If you are more interested in access mechanisms to “SuperOkna” directly from “1C” by data reading directly from the “Superokna’s” PO base “Superokna” then you can always give to your experts a processing prototype for “1C” which clearly demonstrates the principles of such approach. 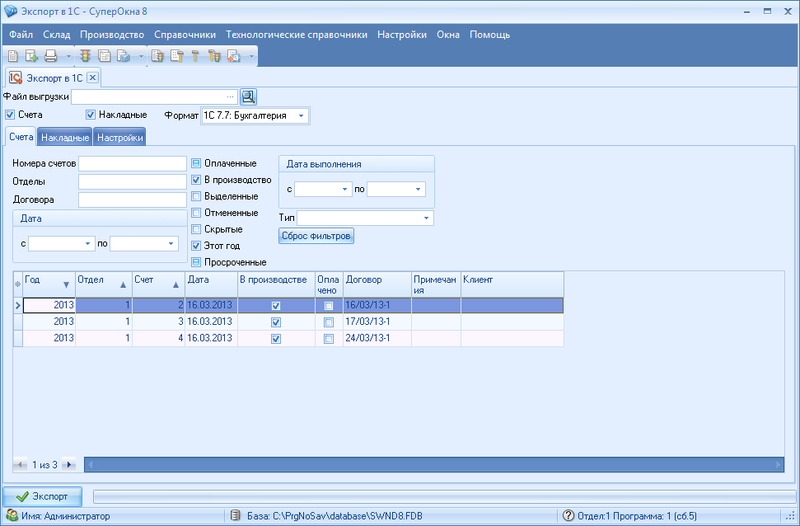 Two various approaches were realized by specialists of our company with one purpose: work of accounts department has to take place “smoothly” and without any slightest stops.